North Shore Medical Center's excellent family medicine specialists. Families looking for a North Shore primary care doctor can find exceptional family medicine specialists affiliated with North Shore Medical Center (NSMC). Family medicine specialists provide care for all members of a family, from infants through adults. A family medicine specialist provides annual physicals and age-appropriate vaccinations and screenings, referring patients to other specialists as needed. 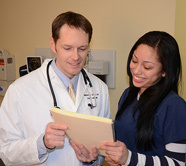 NSMC has close to 40 family medicine specialists with offices throughout the region, including many doctors who offer night and weekend hours. Why family medicine specialists are preferred by many families. Convenience is one benefit for families who have chosen a family medicine specialist. Scheduling back-to-back appointments for multiple family members is easier with a family medicine practice. In addition, parents bringing one family member for an appointment often find that family medicine specialists can easily check on other family members who are present. Family medicine doctors tend to have a better grasp of family health history and the health dynamics between generations, which helps them to provide more consistent care. For teenagers who no longer feel comfortable visiting a pediatrician's office, family medicine specialists are an attractive alternative. Find a Doctor search will help you find the right doctor for you and your family. This easy-to-use search tool enables you to search by physician last name or by practice name, or you can choose to view a list of all NSMC family medicine specialists. You can also search for specialists by gender and language spoken, and further narrow the results to see just physicians who are accepting new patients. Use Find a Doctor for other clinical specialties, for example, an orthopedic surgery Boston practice or 3D mammography expert. Search for a specialist family medicine or a specialist internal medicine.